We Packed Our Bags And Boarded The First Plane To London! Welcome To Another DelightFULL On Tour! We’ve Decided To Dazzle London Design Events W/Our Unique Lighting Design! If you haven’t attended any of these London events in the past few weeks, then you need to update your schedule! DelightFULL was in London in the past 2 weeks hosting a Christmas Cocktail Party, taking part in a super fancy Christmas Celebration design event and basically leaving their mark anywhere they’ve gone! If you missed all these opportunities to get to know us better, that’s ok, we’re bringing you a full article about every detail of the events we’ve been on and how our light was able to brighten up the grey skies of London! We had the honor to participate in one of the most sophisticated and exclusive design events ever happening in London! The Hotel Designs Christmas Meet UP 2017, was hosted in a award-winning luxury private members club named “Home House“, and we had the chance to brighten up the place with some of our unique lighting design products! It was probably one of the best design events we’ve ever been to, having the chance to chat with some of the best award-winning interior designers in the UK, as Dexan Mooren Associates, Fiona Barrett and so on! If you don’t know who this people are, then you can’t call yourself a real interior design lover, they’re some of hottest names right now! We had some of our mid-century inspired products in display and I must admit, we really did turned that incredible space into something even more lovely! Can you picture it? An afternoon event with that end of the day atmosphere, full of joyful people nicely talking and getting to know each other? This was far from being one of those hard selling design events, and we’re glad it wasn’t like this! 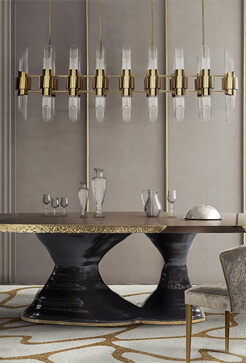 DelightFULL has been clearing up the road to be defined as the best mid-century lighting design brand in the market, as this event really showed what they’re capable of pulling of and how focused they are in reaching for the stars! DelightFULL and Essential Home together with Santorus and other brands of the group , hosted a Christmas Cocktail Party so hot, they made the icy atmosphere of London melt! Santorus is one of our partners and a an enigmatic luxury brand! If you check their work, you’ll obviously notice the evident mixture of cultures in their designs, and I bet you won’t be able to leave the website, since anything you ever dreamed of can be found there! From high-end cushions to wallpapers, fabrics and so on. We were challenged to create some unique and eye-catching environments, using DelightFULL and some of her sister brand’s products, combined with Santorus products! After taking sneak peak at Santorus website, which I’m sure you’ve already done by now, you’re probably wondering how did those environments came of! Santorus has some super colorful fabrics used in several high end imposing items and the combination of Essential Home’s straight lines and DelightFULL’s full of personality lighting design, was simply to die for! We decided to create some inviting environment where you’d be able to fully enter the Christmas spirit while enjoying some drinks and chatting a little bit! Botti Side Table and Amy Floor were some of the mid-century inspired products chosen to brighten up this Christmas Cocktail Party! They’ve filled up the room with their characteristic design and strong identity and really took DelightFULL’s and Essential Home’s personality to a whole new level!